Originally from Germany, Oktoberfest has turned into an international celebration pretty fast mostly thanks to its fun nature: good times, music and food. Over 6 million people attend this event each year only in Germany and they consume more than 7 million liters of beer! The world’s largest beer festival takes place in late September – early October, more specifically in the 16-day period leading to the first Sunday in October. If the first Sunday falls on the 1st or 2nd, then the festival would run until October 3rd. As this is the case in 2016, the German Oktoberfest will be held between September 17th and October 3rd. Oktoberfest is an over 200 years-old tradition that started in 1810 in Munich, when the town people were invited to celebrate the wedding of the Bavarian Crown Prince Ludwig and Princess Therese von Sachsen-Hildburgahausen. Horse races with over 40,000 spectators were held to honor the newlyweds. The decision to repeat the celebrations in 1811 started what it is now known as the annual Oktoberfest tradition. Year after year, new fun activities were added, such as tree climbing, bowling alleys or swings. Since the late 19th century, a Fun Fair has been part of the celebrations, with roller coasters, a Ferris Wheel (Risenrad) and a flea circus included. Nowadays, the Oktoberfest celebrations start with the big parade of the tent proprietors and the Munich breweries. To honor tradition, the parade is headed by the Münchner Kindl, the Munich city mascot, followed by the horse cart with the mayor of Munich. After them, tent proprietors and breweries follow in their beer wagons with garlands and wooden barrels. Then, it is customary for the Munich mayor to tap the first keg of beer with the exclamation “O’zapft is!” (“It’s tapped!” in the Austro-Bavarian dialect), thus officially opening the Oktoberfest. The traditional program continues with a 7 kilometers long costume parade, which presents a variety of traditional costumes, habits and dancing routines. The parade is accompanied by musicians and flag bearers. The costume parade was first held in 1835, to mark the 25th wedding anniversary of King Ludwig I and his wife Therese. 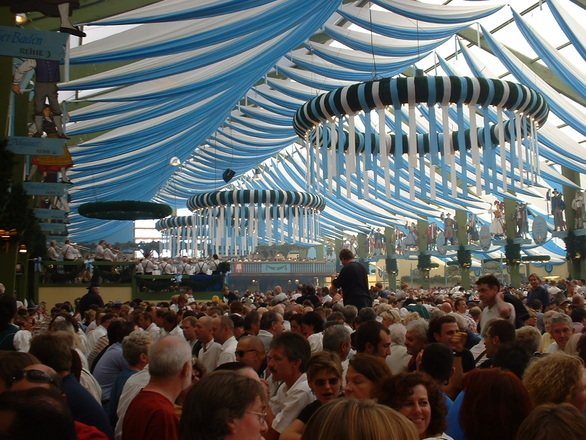 Traditional food served at Oktoberfest include roasted meats, such as Hendl (grilled whole chickens), hearty fare, roasted ox tail, grilled pork knuckles, the Bavarian Weißwürste (steamed white veal sausages served with sweet mustard), potato dumplings, pretzels, Blaukohl (red cabbage and apple dish). Some of the typical desserts include apple strudel, Kaiserschmarrn (a sugared pancake with raisins), Dampfnudel (a steamed honey-dumpling served with vanilla sauce), Zuckerwatte (cotton candy), gebrannte Mandeln (sugar-glazed almonds). But, after all, it’s all about the beer. The traditional Oktoberfest beer is of a variety called Märzen, a dark and strong bottom-fermented beer, lagered for at least 30 days and containing up to 6% alcohol. The Oktoberfest beer is brewed according to strict German standards that precisely define the four ingredients allowed in the brewing process: barley, hops, malt and yeast. Brass and folk music are most commonly heard at the festival, but other genres are represented as well. After more than two weeks of beer, food and concerts, the time comes for the traditional gun-salute on the steps of the Bavaria monument, which marks the end of Oktoberfest celebrations. • In its history, Oktoberfest hasn’t been celebrated 24 times due to different reasons. For example, in 1854, the festival was cancelled because of the cholera epidemic in which 3,000 Munich residents died; in 1866, Bavaria was involved in the Austro-Prussian War. Oktoberfest was temporarily suspended from 1914 to 1918 and from 1939 to 1945, due to World War I and II. In 1923 and 1924, the festival was cancelled due to heavy inflation. • Beer was first served in glass mugs at Oktoberfest in 1892. Before that, mugs were made of stone and then of metal. • In 2010, 130,000 beer mugs were ‘accidentally stolen’ by participants. They were quickly confiscated and taken back to their tent owners. • Waiters must be able to carry 10 beer mugs (1 liter each) at a time. • At the 200th anniversary of Oktoberfest in 2010, a ‘time-travel’ Oktoberfest was held the day before the actual festival commencement, with horse races, a museum tent and specially brewed beer based on the historical Oktoberfest recipes. • In 2005, the concept of “quiet Oktoberfest” was developed, meaning that loud pop or electric music is permitted only after 6 p.m. Before that hour, the bands in beer tents only play quiet brass and folk music, limited to 85 Decibels. • The Oktoberfest Lost & Found gathers around 4,000 items every year. With a giant beer mug in their hands, visitors easily forget about their other possessions. The collection of lost objects includes over 1,000 passports, 350 mobile phones, 370 pairs of glasses, 1,300 items of clothing etc. Even 48 children went missing, but luckily they were all reunited with their families. Germany obviously hosts the biggest Oktoberfest, but nowadays the festival is famous everywhere around the world, being carried through by the German immigrants and their descendants. The second largest Oktoberfest festival in the world takes place annually in Canada in the twin cities of Kitchener and Waterloo, Ontario and around 1 million people participate. You can enjoy beer-based activities as well as the most important event, the Thanksgiving Day parade. As a coincidence, the closing day of the Bavarian Oktoberfest also falls on the German equivalent of Thanksgiving. As the majority of the population has German roots, a common phrase at the celebrations is Gemütlichkeit, which stands for congeniality or warm friendliness. Americans love Oktoberfest, too. Cincinnati, Ohio, hosts the most important Oktoberfest festival in the country. It is called Zinzinnati and it has more than half a million attendants. Commonwealth of Pennsylvania is known for its large German immigrant population which made the celebration known towards the end of the 20th century with the rise of microbreweries and with the opening of authentic German brew houses in the area. Several southern Brazilian cities, populated by Germans in the 19th and 20th centuries, celebrate Oktoberfest annually since 1984. The biggest celebrations take place in Blumenau where people can enjoy 18 days of music, dance and food, honoring Brazilian ancestors that arrived from Germany. In Australia, Oktoberfest Party was initially being celebrated mostly by students around university campus grounds but this was soon banned. So, a more organized event was put together by specialists. That is how Oktoberfest in the Gardens was born, the largest celebration of its kind in Australia. There is also the Harmonie German Club, Canberra, which holds a three-day Oktoberfest festival every year in October. No matter where you are in the world, for sure there is an Oktoberfest festival close by that you can enjoy. If you decide to travel and visit one of the biggest Oktoberfests in the world, remember to stay in touch with your loved ones back home with NobelCom international calling cards.